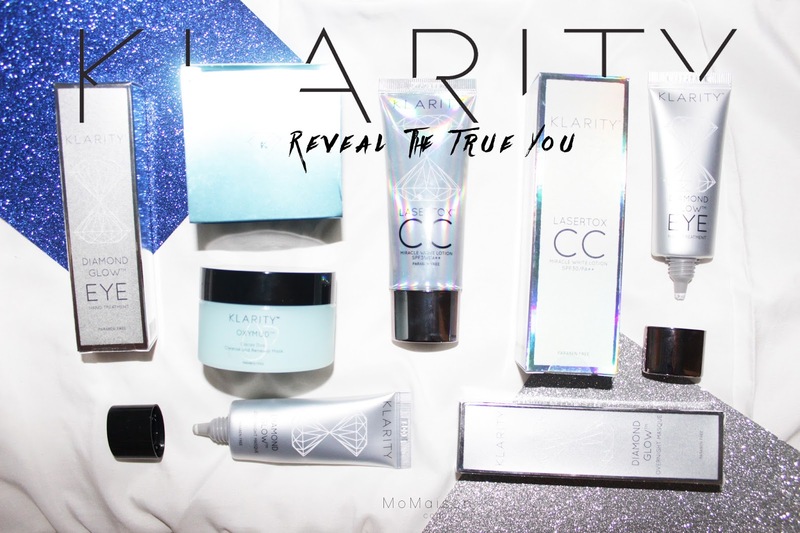 Klarity is a skincare series developed through cosmetic-science and high medical-grade ingredients. They offer a wide range of products targeting different problem areas and I got to try their OxyMud Cacao Cleanse & Renewal Mask, Diamond Glow Overnight Masque, Diamond Glow EYE Nano Treatment and Lasertox Miracle White CC Cream. Their products are formulated in Singapore and made in Korea with technology from France. Their OxyMud Cacao Cleanse & Renewal Mask is quite the special product, with one of a kind effects on the face. The mask is made of unique chocolate. In the jar, it appears a dark chocolate colour but it reacts with (I suppose) warmth to change into a lighter brown oxygen foam. I was amazed the first time I tried it. Especially so when I was washing it away, my face felt super smooth I thought that the product was still on my face only to find out that it's gone and it was just my smooth face. It feels like butter on my face, I even wanted to check the ingredient list to see if butter is one of their ingredients hahaha! It utilizes the Theobroma Cacao fruit powder, which contains moisturizing qualities, a large amount of different antioxidants, preventing premature aging by fighting against free radicals. There is also the natural exfoliation enzyme technology used to work on smoothing and softening the skin. 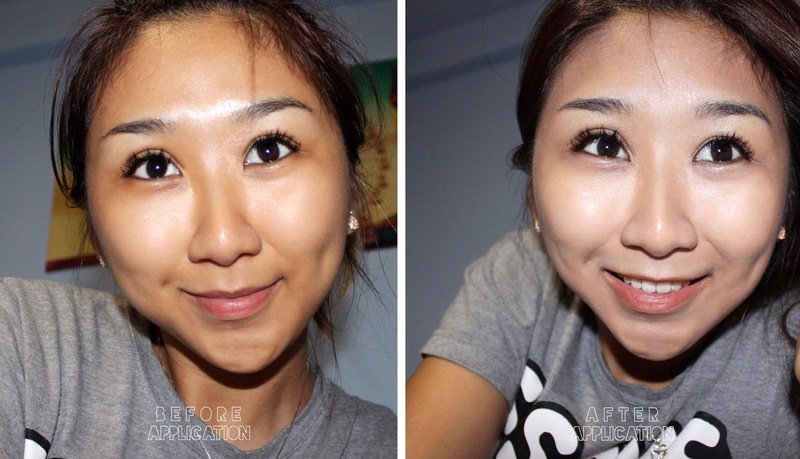 It can remove dirt, oil, makeup and other impurities on your face. This is their Lasertox Miracle White CC Cream. I love their holographic packaging, it's so pretty!!! 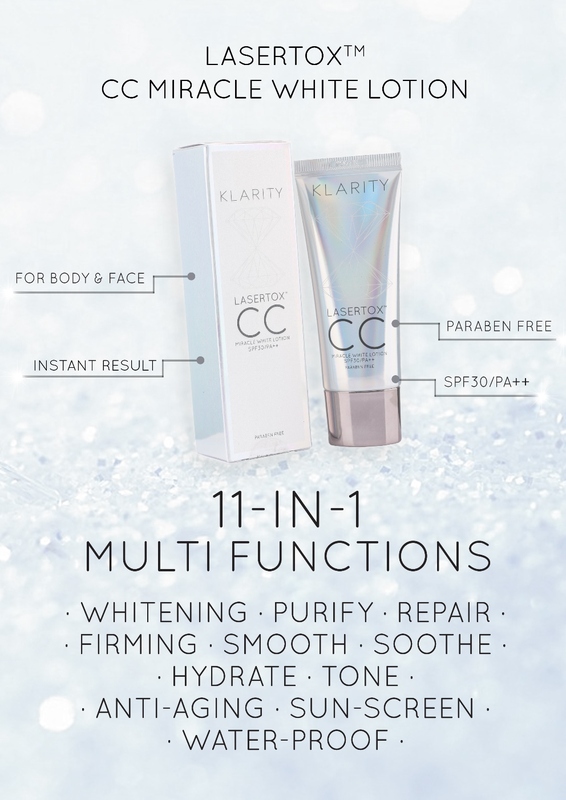 Klarity claims that this CC cream helps to restore your beauty with at least one tone lighter whiter effect instantaneously because it is enriched with diamond powder. I put their claim to the test to show my readers. It can be used on its own as my makeup base, or it can be used together with foundation. This would however, make a great alternative to foundation if you want a light base, as it has 11 multi-functions in 1! No more having to apply numerous skincare products before your makeup routine! Other than these, it is a non-colorant / non-tinted CC cream! Diamond Glow Overnight Masque is another great product. You don't have to wait 15-20 minutes for a sheet face mask now, just sleep on it and wash it off the next morning! Get your beauty sleep together with your beauty face mask because sleep is as important to your skin as facial mask treats are. Like the Miracle White CC Cream, it contains diamond powder giving my face a radiant glow. The overnight mask actually activates the skin's natural moisture defences and promotes collagen production. And the last product I got to try was their Diamond Glow Eye Nano Treatment. This product power packs 10 functions in 1 as well, them being: instant glow, purifying, repairing, firming, smoothing, soothing, hydrating, rejuvenating, anti-dark circles and anti-wrinkles. The eye cream also has diamond powder in it's list of ingredients. It really does make my eye look brighter. You can purchase their products from Klarityskin SHOP or Secretive.sg.